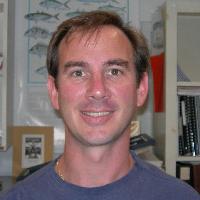 My research focuses on understanding the biological and ecological processes that regulate fish early life history population dynamics. The early life history of fishes is a dynamic period with many factors governing rates of growth and mortality that help shape year class strength. Understanding the driving forces and variability that is observed in abundance of juvenile fishes is an important component of fisheries management. Since many marine fishes use estuaries and tidal waters as nurseries, most of my attention is on coastal systems. I incorporate modeling techniques and field based research to address ecological questions about recruitment variability. Characterization of nursery habitats used by black sea bass and summer flounder in Chesapeake Bay and the coastal lagoons. Funded by NOAA Chesapeake Bay Office. Threshold effects of altered shorelines on forage species: Baywide approach and subestuary approach. Funded by the Chesapeake Bay Trust. Quantifying habitat suitability for forage fishes in Chesapeake Bay: A coupled modeling approach using fishery surveys and a hydrodynamic model. Funded by NOAA Chesapeake Bay Office. Estimating relative juvenile abundance of ecologically important finfish and blue crabs in the Virginia portion of Chesapeake Bay and tributaries (Also known as the Juvenile Fish and Blue Crab Trawl Survey). Funded by the Virginia Marine Resources Commission, and the Virginia Marine Recreational Fishing Advisory Board. Estimating relative abundance of young-of-year American eel, Anguilla rostrata, in the Virginia tributaries of Chesapeake Bay. Funded by the Virginia Marine Recreational Fishing Advisory Board and the Virginia Commercial Marine Improvement Fund. Estimating relative abundance of young-of-year American eel, Anguilla rostrata, in the Potomac River. Funded by the Potomac River Fisheries Commission. Tuckey, T. D. and M. C. Fabrizio. 2016. Variability in fish tissue proximate composition is consistent with indirect effects of hypoxia in Chesapeake Bay tributaries. Marine and Coastal Fisheries 8:1-15. Nys, L. N., M. c. Fabrizio, and T. D. Tuckey. 2015. Multi-decadal variation in size of juvenile Summer Flounder (Paralichthys dentatus) in Chesapeake Bay. Journal of Sea Research 103:50-58. Tuckey. T. D. and Mary C. Fabrizio. 2013. Influence of Survey Design on Fish Assemblages: Implications from a Study in Chesapeake Bay Tributaries. Transactions of the American Fisheries Society 142:4, 957-973. Tuckey, T. D. and J. E. Olney. In Revision. Growth, mortality, and recruitment of age 0 American shad cohorts in lower Chesapeake Bay nurseries. Marine and Coastal Fisheries. Latour, R. J., E. J. Hilton, P. D. Lynch, T. D. Tuckey, B. E. Watkins, and J. E. Olney. 2012. Evaluating the current status of American shad (Alosa sapidissima) stocks in three Virginia Rivers. Marine and Coastal Fisheries: Dynamics, Management and Ecosystem Science. 4:302-311. Tuckey, T. D. 2011. ‘Alosine life history in Chesapeake Bay.’ In Ecosystem Based Fisheries Management for Chesapeake Bay: Alosine Species Team Background and Issue Briefs. Ed. T. Tuckey and A. Read. College Park, MD: Maryland Sea Grant. Tuckey, T. D. and B. Sadzinski. 2011. ‘Flow and water quality.’ In Ecosystem Based Fisheries Management for Chesapeake Bay: Alosine Species Team Background and Issue Briefs. Ed. T. Tuckey and A. Read. College Park, MD: Maryland Sea Grant. Tuckey, T. D. and J. E. Olney. 2010. Maturity schedules of female American shad vary at small spatial scales in Chesapeake Bay. North American Journal of Fisheries Management. 30:1020-1031. Tuckey, T. D., N. Yochum, J. Hoenig, J. Lucy, and J. Cimino. 2007. Evaluating Localized vs Large-scale Management: The Example of Tautog in Virginia. Fisheries 32(1):21-28. Tuckey, T. D. and M. Dehaven. 2006. Fish assemblages found in tidal-creek and seagrass habitats in the Suwannee River estuary. Fishery Bulletin 104:102-117.